BSM Slushfest 2006 - Off the scale! It’s not fair. We get the newest bikes but get to have no fun. ‘Wipe those smiles off! You think we’re out here to have fun?’ It’s hard work hunching behind pinty fairings to eke out more kph. Or running another economy test to verify whether it is 113.1 kpl or 111.3 kpl. So once a year, we take a break. Welcome to the slushfest. It isn’t a test. There are no rankings. And it is intended to allow us to let our rapidly dwindling hair down (Speak for yourself, Shumi. Nandu and I still have our locks – Joshua). 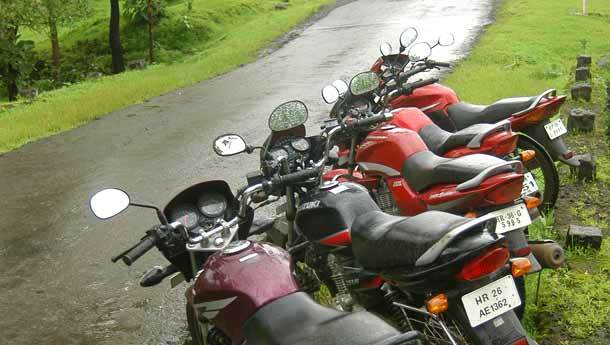 We had planned a proper, well-coordinated test to take our long term fleet (Pulsar 180, Achiever, Gladiator, Zeus and Shine) out for the day and get them muddied, but hopefully, not broken. Slushfest’05 was so much fun, we decided against changing the format too much. Test one, Aquarium: two monumental water crossings (like a WRC stage: one crossing, run both ways). Test three, Mud Rush: wind down by powersliding around a bunch of very surprised trees. Except that the water was a full four inches higher than last year, and the grassy knoll around the trees had too much water, and consequently not enough traction. With Shreenand out enjoying Old Blighty, we found ourselves a bit short on manpower. So, we invited the Open Sky lasses, Noddy and Naughty, er... Geetanjali and Elizabeth. And Shuchi, of course. Andrea, Joshua’s girlfriend, decided to come and do some shutter bugging as well. Then we realised that none of them rode bikes. Enter Vivek Jaising (in the middle), fresh off his Suzuki GSX-R1000 and Neil Grant (next to Shumi), who’s been spinning up his Kawasaki ZX-10R. At the very least, both would have a different two-wheeled experience. Joshua invited unsuspecting Saraid (yellow chap), friend, riding buddy and neighbour along as well. 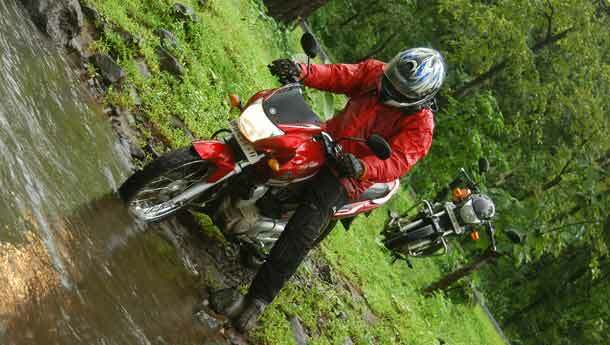 Plus, there’s Bijoy (ever the enthusiastic mud-plugger), Joshua (the fearless throttle wringer) and me. It was my idea to do a ‘50s British trials style slushfest for BSM and it remains one of the best decisions I have ever taken. It is one thing to commute, another to cross continents and still more bonkers to challenge nature with the average Indo-Japper. I thought the Shine was not inviting enough but it proved to be a true Honda – starts first kick, great grunt for a 125 and super refinement. On the highway, it’s stable unless you get crosswinds. Deserves a fifth gear, though – it feels a tad too stressed even at 80 kph in fourth. The water was higher this year, I was down on torque – a lot of shoulder went into getting the front wheel off slippery stones. But the rear (Shumi, stop lifting it off, will ya?) worked like a propeller and kept us moving. I was sapped of power (from shoulders and thighs) on the return and thought I would never make it across. But the Shine came up trumps. Whoa! This was new and this was fun. Can we do it again and again and again? You don’t know how energy sapping this is. No amount of pics can show you how my arms were quivering after a stint. Joshua/Zeus went first and made all the mistakes, so we knew the lines. 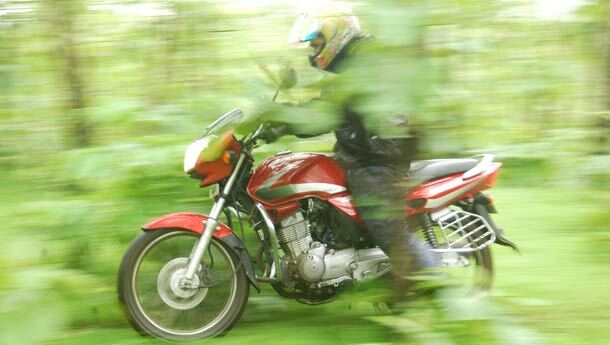 The trick was to contemplate before the twist – short bouts of acceleration snap the bike clean off the roots and rocks. I’d have loved to do this on the good old Unicorn. Brilliant fun overall. I learnt that girls can be good riders. Way to go Andrea! This is something all riders should try. If you know what to do when a wheel starts sliding, you should survive most motorcycle dynamics related stuff. I am sure Rossi did this and Biaggi didn’t. The Ambition, er... Achiever, was easy to control and the Apache was nimble too. It is amazing how good a combination of power, torque, leg power and skill you need to do this well. ‘It appeared scary but after I watched the Shine go through I was confident. The submerged rocks were mossy and you couldn’t get a good grip, though. 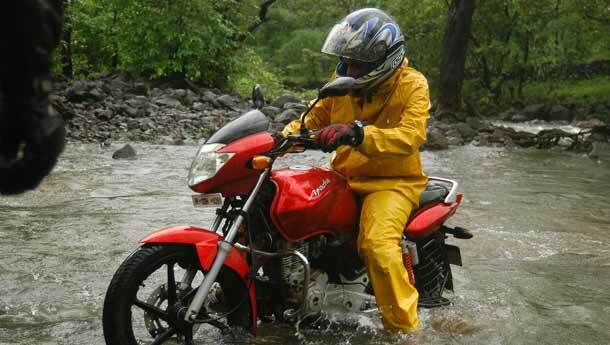 The clutch action was prompt and the bike went through smoothly. I really enjoyed the rush. You can’t see what’s ahead or under you, you never know what’s going to happen. Would definitely love to do it again. Having been on this very Gladiator before, Vivek plumped for this one almost instantly. Obviously, we hadn’t told him that the Apache (Saraid) and Achiever (Neil) were 150s. Here’s what he went through in his words. Last Slushfest, I was spectator/ navigator/ support crew. Not this time. The Suzuki wasn’t my first choice, but it is a mobike and I’m not complaining. The Zeus still misses a battery (we’re just too lazy to replace the faulty OEM one) so no horn and keeping the lights on made the engine feel weak at low revs. But it felt adequate for the highway. Overtaking was easy and the Zeus matched the Shine. The Zeus was the last to go in. And go it did. Wide open throttle from go (not to be repeated, ever) had me dive in with a big splash. 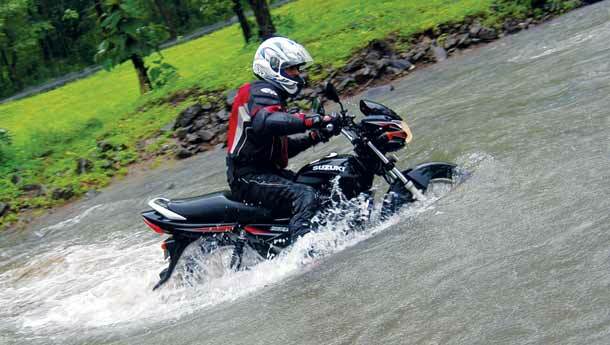 The momentum carried me through, dispelling my fears of the fender-high water. Lesson: on the throttle, off the clutch and look where you want to go. It couldn’t be simpler. Having thoroughly enjoyed the river crossing, I was really enthu and went first. Initially it was easy, but enthusiasm and impatience got the better of me as I rode higher. The Zeus was beached a couple of times with the engine cowl taking most of the beating (it’s still intact) while the handlebar came loose. By the end, it seemed as if my hands were going to disengage themselves from my arms. Although the Zeus is the torquiest of the 125s, it struggled through this challenge. I really wish I had a 150 for this leg . Boy, oh boy! I could hardly wait for this. Last year, the boys went crazy and this year I had my chance. I started off with the Shine, and spun it right around before I managed a dignified take off. A couple of other harmless spills were part of my initial run. As things progressed I got better and later decided to try it two up with Andrea. Big mistake – I’ll be paying for that spill for a very long time. Neil had the only other 150 in the bunch. Of course, he didn’t know it until later. We even had to tell him it actually had a push-button start! Not for me. I knew I had to ride back in a couple of hours through (probably) torrential rain. And watching others do it made me doubly sure. It was like digging a grave with a toothpick. But full points to the lads who bashed it through. Well, that just about wraps it up for another edition of BSM’s off-road event, Slushfest 2006. We learnt two things this year on the ride. One, it doesn’t have to make complete sense to be outrageously fun. And two, it isn’t as difficult as it looks. Especially in hindsight. And now, since I’m tired of having pushed all the bikes that got stuck now and then, tired of having walked Aquarium and Salmon Spirit with every single motorcycle, if you don’t mind, I’m off. Neither Geetanjali nor I had any idea of the things our colleagues do with bikes and cars, despite trying hard to grasp the Greek and Latin they publish every month. We do understand that theirs is a one-of-its-kind magazine catering to another genus – the Motor Sapiens. 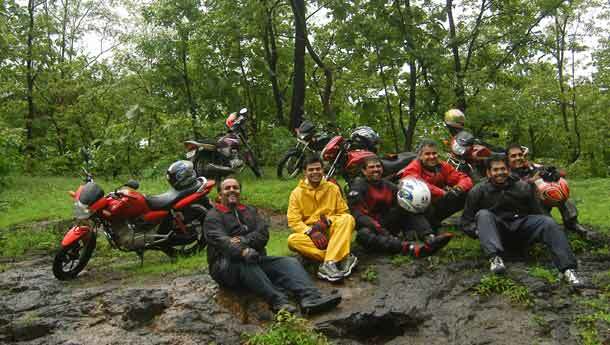 We set off in a cheery mood, ostensibly for a monsoon excursion. We did stand exactly opposite where we were supposed to, and ended up running an hour late. Then came a traffic snare and a deluge in the middle of the road – it was the perfect day for a slush fest. 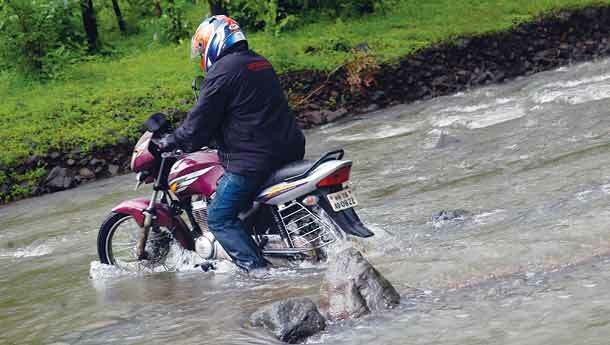 Six bikes braving a monsoon-crazed river some twenty feet wide, taming a rocky stream... what, for heaven’s sake, were they doing? Trekking on bikes? They’ve done it for years, I guess. For me it was madness, complete with a photographer to capture it perfectly. The word-painting was entrusted to one of the insane ones. The romance of the unspoilt green lasted only till Bijoy drew a track with his Shine. Then it resembled a green and muddy skating rink where even seasoned bikers (like ours) would eventually slip and fall.